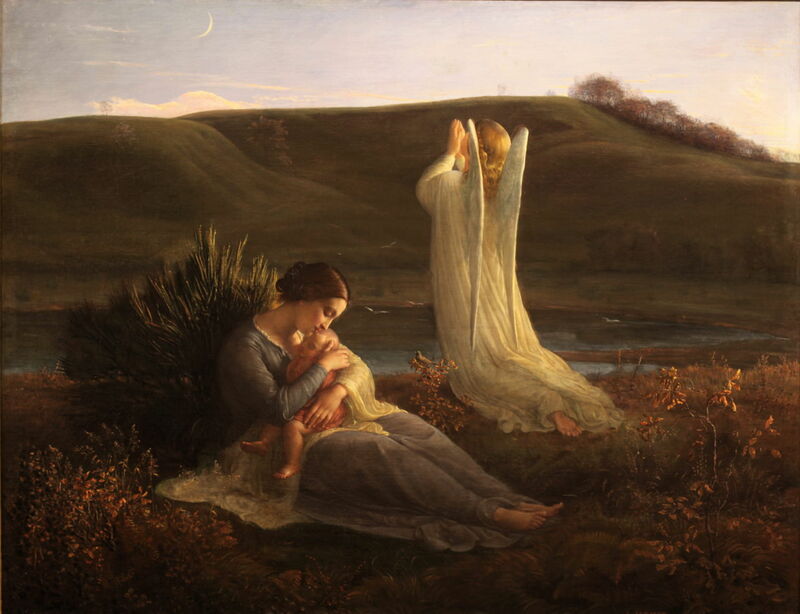 Louis Janmot (1814–1892), The Angel and the Mother (Poem of the Soul 3) (1854), oil on panel, dimensions not known, Musée des Beaux-Arts, Lyon, France. Courtesy of Musée des Beaux-Arts, via Wikimedia Commons. It is not unusual to paint a narrative series, but as I have shown with such series by Thomas Cole and Hogarth, these tend to be relatively short compared with the images in, say, a graphic novel. The painter who came closest to creating an epic in his works must be Louis Janmot (1814–1892), whose series Le Poème de l’âme (Poem of the Soul) consists of no less than 34 images, of which the first eighteen are painted in oils, and the remaining sixteen are in charcoal. Miraculously, the complete series is still together, in the Musée des Beaux-Arts in Lyon, France. Although the captions do not say so, each of the oil paintings is 130-145 cm in height, and 140-145 cm in width (although I have also seen them stated as being much larger, approximately 394 x 500 cm). In this and the next three articles, I am going to show the complete series, and try to provide some supporting information for each work. This and the next article cover the first group, the eighteen oil paintings. Janmot was born, trained, and lived for much of his life in Lyon. He studied at the École des Beaux-Arts de Lyon from 1831, and won its Golden Laurel. In 1833, he was a pupil of Ingres in Paris, and spent a year in Rome in 1835. He painted traditional narrative and religious works to start with, and started work on his epic series as early as 1835. All eighteen oils were completed in time to be shown at the Exposition Universelle in 1855, after which he continued work on the charcoal drawings until they were completed by 1881. His work was intermediate between Romanticism and Symbolism, and has been associated with an early equivalent of the Pre-Raphaelite movement in France. It influenced Puvis de Chavannes, Odilon Redon, and Maurice Denis. 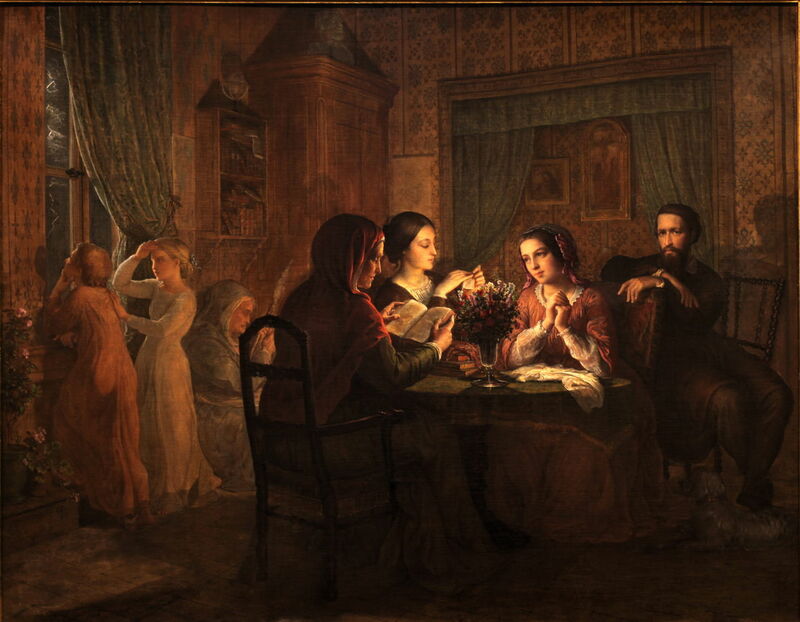 Like Blake and Dante Gabriel Rossetti, Janmot was an accomplished poet, and the series is accompanied by an epic poem of nearly three thousand lines. I am not aware of an English translation, and I have not yet had time to read it, let alone translate any of it! 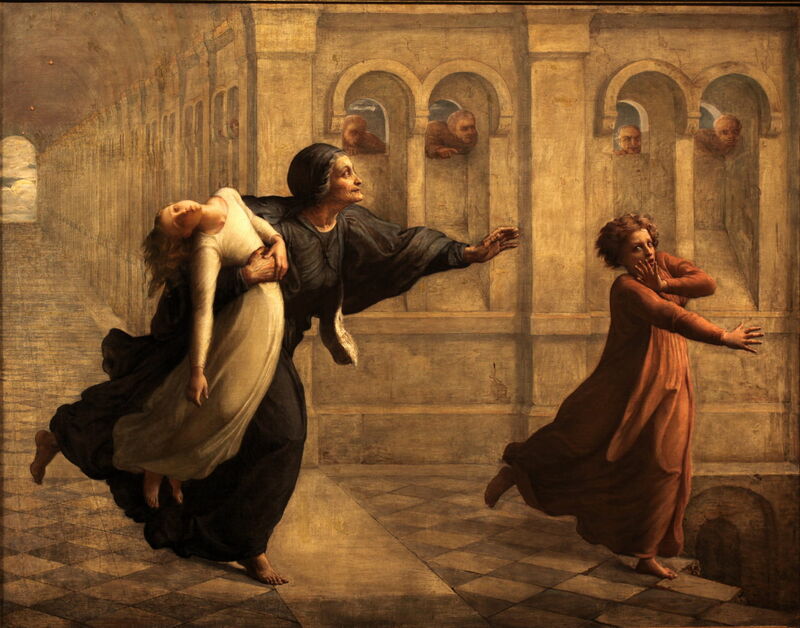 Janmot had a deep Catholic faith, and both the poem and the paintings are framed within his beliefs. 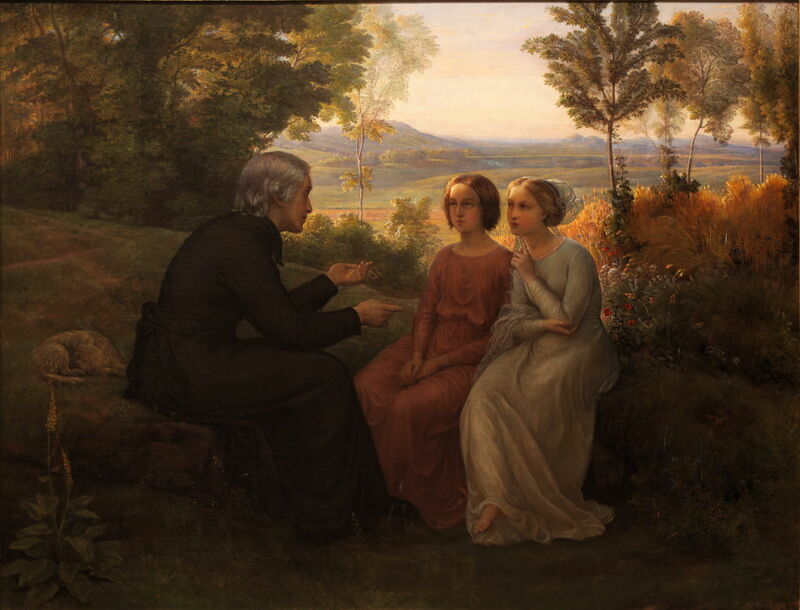 Louis Janmot (1814–1892), Divine Generation (Poem of the Soul 1) (1854), oil on panel, dimensions not known, Musée des Beaux-Arts, Lyon, France. Courtesy of Musée des Beaux-Arts, via Wikimedia Commons. The series opens in heaven, with the mystical formation of a human soul, shown in symbolic form as a baby. This takes place under the watch of the Holy Trinity, although the three figures surrounding the newborn soul include a woman who represents love. Around this tight group are seemingly endless ranks of angels. 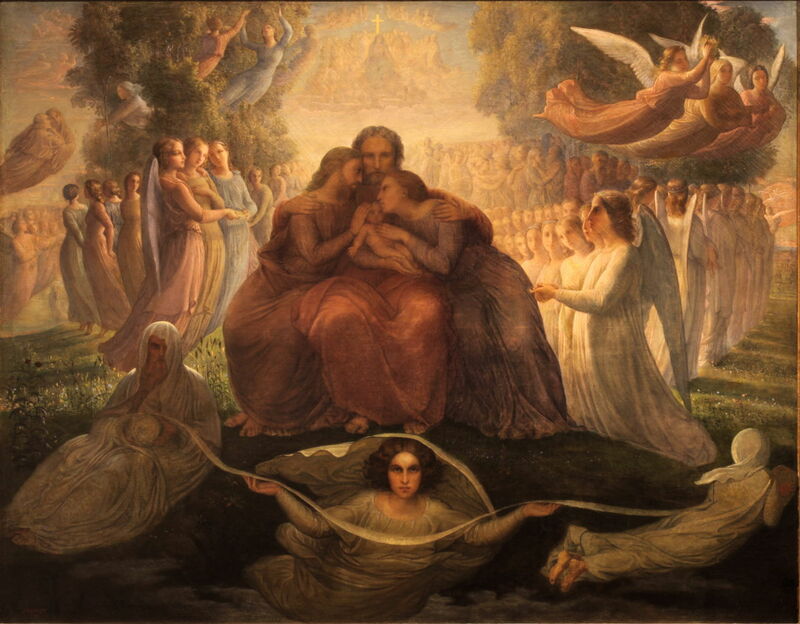 Louis Janmot (1814–1892), Passage of the Souls (Poem of the Soul 2) (1854), oil on panel, dimensions not known, Musée des Beaux-Arts, Lyon, France. Courtesy of Musée des Beaux-Arts, via Wikimedia Commons. The newborn soul is brought down to earth by its guardian angel. 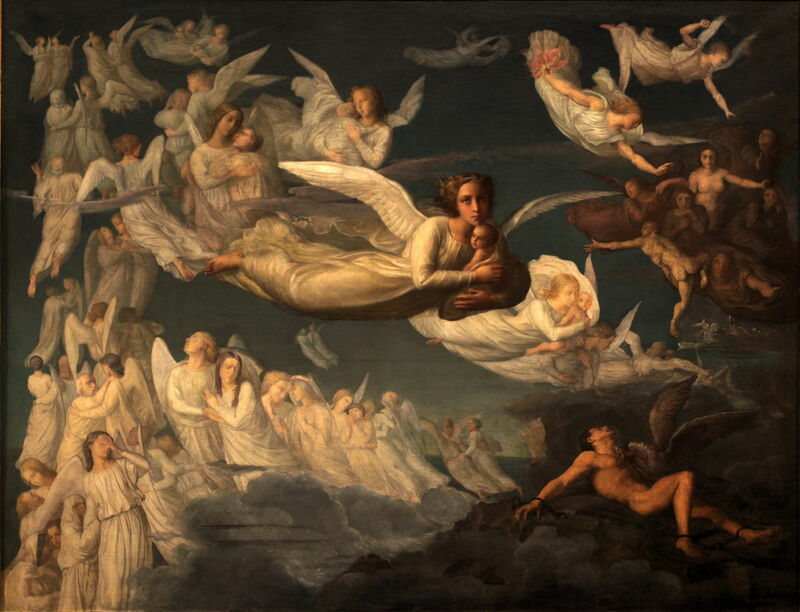 This view, midway between heaven and earth, shows the succession of newborn souls being taken down to earth in the centre, and the judgement of the dead taking place at the side. 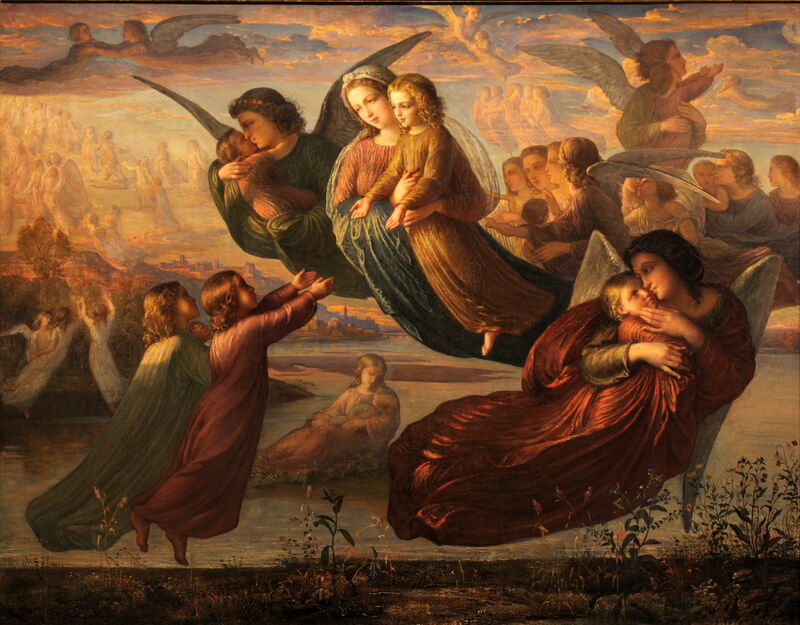 The souls of the virtuous are seen being accompanied back up to heaven by their guardian angels, at the left. On the right are those destined for hell. Below, on the right, is the figure of Prometheus bound, being attacked by an eagle. Prometheus is a strange figure from classical mythology to appear in this series, but a strong symbol of eternal suffering. This is set by the Lake of Moras, where the mother sits with the newborn soul on her lap. Its guardian angel is kneeling in prayer for the mother and the soul of her new child. This painting combines the images of the annunciation to the Virgin Mary, and the Virgin Mary with the infant Jesus, in a unique way. Louis Janmot (1814–1892), Spring (Poem of the Soul 4) (1854), oil on panel, dimensions not known, Musée des Beaux-Arts, Lyon, France. Courtesy of Musée des Beaux-Arts, via Wikimedia Commons. As the child grows up, Janmot represents it as a duality of boy, shown here in pink, and girl, in white symbolising purity and innocence. 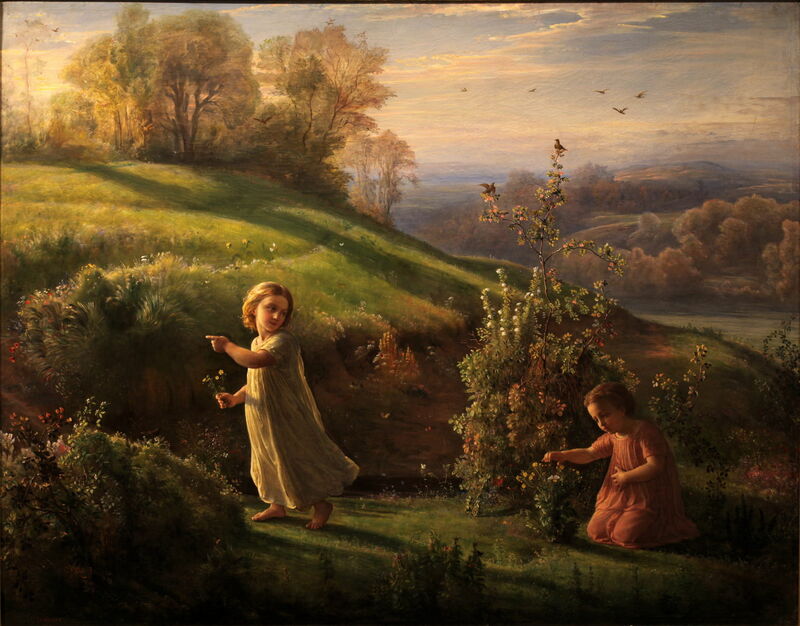 The pair are shown at play, picking flowers, in an idyllic country landscape during the spring. This mystical duality continues through most of the rest of the oil paintings. At times, the pair appear to be brother and sister, or even lovers, but as we will see, in the end they represent the earthly body (boy) and the spirit (girl). They are usually colour-coded, the boy wearing pink, and the girl white. Louis Janmot (1814–1892), Memories of the Sky (Poem of the Soul 5) (1854), oil on panel, dimensions not known, Musée des Beaux-Arts, Lyon, France. Courtesy of Musée des Beaux-Arts, via Wikimedia Commons. The young child is dreaming here, of the sky full of angels bearing other souls. This shows the perpetual alliance between the soul and its guardian angel, and the link back to heaven. Janmot made this painting first out of the series, and it is set in Mulatière near Lyon, his birthplace. Louis Janmot (1814–1892), Fatherly Roof (Poem of the Soul 6) (1854), oil on panel, dimensions not known, Musée des Beaux-Arts, Lyon, France. Courtesy of Musée des Beaux-Arts, via Wikimedia Commons. The child’s family are at home during a thunderstorm, shown by the flashes of lightning at the window. Grandmother reads a psalm to calm the spirit, while the mother and another young woman sit and sew. Father (a self-portrait at the age of thirty) looks on with concern. An even older woman, perhaps the great-grandmother, sits in the shadows near the window. 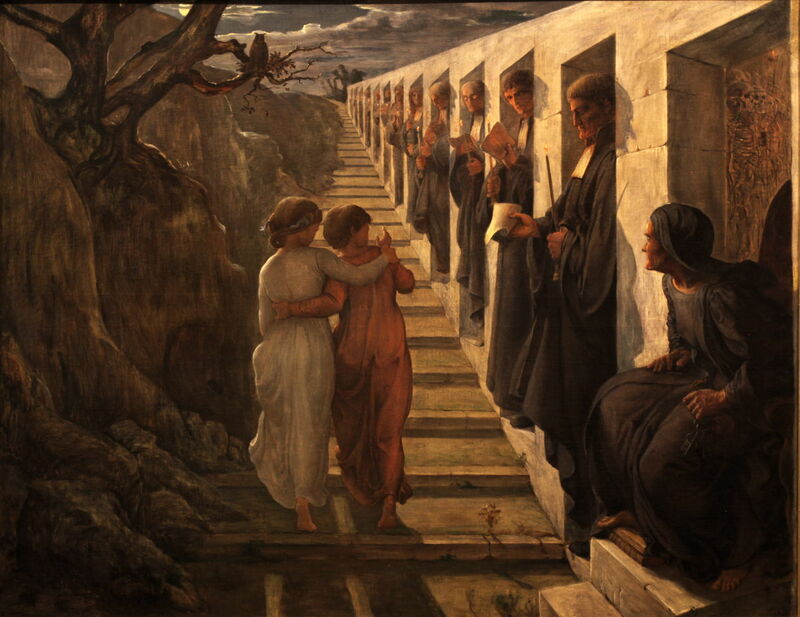 Louis Janmot (1814–1892), The Bad Path (Poem of the Soul 7) (1854), oil on panel, dimensions not known, Musée des Beaux-Arts, Lyon, France. Courtesy of Musée des Beaux-Arts, via Wikimedia Commons. The couple have grown now, and find themselves walking along a path by the university. In the niches alongside the path are its professors, each offering false learning which might replace their faith. That learning is represented by the combination of papers and a lighted candle. In the niche closest to the viewer is the figure of death itself, its niche decorated with skeletons. The land is rocky and barren, with a wizened tree, on which an owl is perched. Louis Janmot (1814–1892), The Nightmare (Poem of the Soul 8) (1854), oil on panel, dimensions not known, Musée des Beaux-Arts, Lyon, France. Courtesy of Musée des Beaux-Arts, via Wikimedia Commons. This nightmare follows on from the previous painting, and shows the figure of death pursuing the child, already clutching the limp soul with its right arm. As the boy tries to run ahead, the ground falls away from under his feet. Gargoyle-like heads watch the chase from tiny windows. Louis Janmot (1814–1892), The Grain of Wheat (Poem of the Soul 9) (1854), oil on panel, dimensions not known, Musée des Beaux-Arts, Lyon, France. Courtesy of Musée des Beaux-Arts, via Wikimedia Commons. The nightmare past, the couple are being taught by a priest beside a ripe wheatfield. A dog, indicating fidelity, is asleep nearby, and the light of the Holy Spirit shines on their foreheads. I first saw some of these painting when I visited Lyon in 1993. I was very impressed. I was not able to buy any literature or reproductions then. I then forgot about all about it. When I moved recently I found some notes I wrote on my trip and rediscovered Janmot again in your website. Thank you so much. You did a great job! It’s tragic that they are so undocumented, particularly now that they are long out of copyright. I’m sure that someone has electronic copies of Janmot’s poem and other material which could be made freely available.